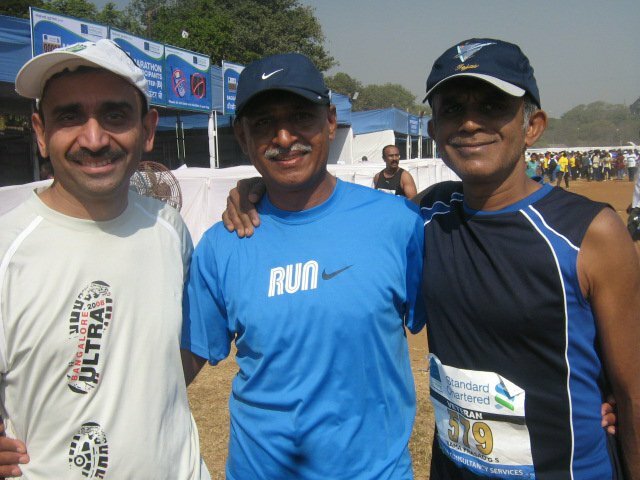 While the Mumbai marathon on 16th January was my best ever Full marathon run where I comfortably exceeded my goal of 3:59 by clocking 3:52:48, the last couple of days leading up to the race was quite nerve-wrecking. I usually am quite nervous before a big event specially if I am targeting a specific time or a new distance. Even then this time was different - maybe it was the pressure of aiming to do my first sub 4 hr in India. Or the fact that the last time I attempted a sub 4 hr FM in October 2010 I ended up with cramps and missed it by a whisker. I felt extremely hungry in the 48 hours before the race eating much more than normal. I was a bit apprehensive of getting to the start point well in time for the early start time of 06:15am. Specially the last 12 hours from Saturday evening after returning home from WTC was a very nervy and restless period so much so that I started feeling light pain in my tail bone. All of this fortunately had no impact in the end as the race went as perfectly as possible on Sunday morning. As has been my tradition for the past several years I landed in Mumbai Friday evening and went to WTC to collect the race bib on Saturday morning a little of noon. 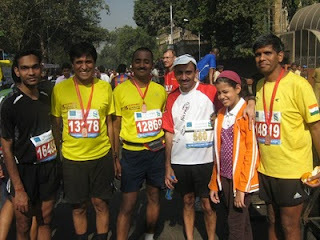 And as usual I met a number of familiar runners from Bangalore, Chennai, Hyderabad and Delhi. Also met a few new runners as well. As always the excitement, energy and passion among the runners was great. After lunch at La Flamboyante in WTC I returned to Govandi by about 5PM. One thing I noticed was that Mumbai was less warmer and less humid on pre-race day comapred to the previous years. Was praying that race day weather would be at least s good. I tried to relax as much as I could. The 2nd India-South Africa ODI in SA served a good distraction. I went to bed around 9:45PM soon after India got bowled out for 189 with the intent of waking up around 3:45am. I slept reasonably well and woke up just before the alarm rang. I got ready by about 430am and informed the security to send me an auto. Within about 7 minutes there was an auto on my doorstep which took me to Chembur station where I caught the 4:45am train and reached VT station by 5:20am. This can only happen in Mumbai in India - very impressive!In the train I chatted with a bunch of runners who got off at Vadala to head to Bandra for their HM start. Given the segregation of the FM and HM start points VT station was not that crowded. I changed into my shoes and headed towards the entry gate in Azad maidan. While wearing my shoes the timing chip came off from the plastic tag and I had to thread it through my shoe lace. I thought this was not a good start - in the end of course it had no impact. En route I met Pani and Sid - two other veteran runners from Bangalore(see photo below taken inside Azad maidan after finishing the race and collecting medal, refreshments etc). In side the maidan of course there were a lot of familiar FM runners. After some warm up, I consumed a half of my fourth banana(had eaten 3 before leaving home) and checked in my bag in the baggage counter and moved to the holding area around 6am. The gate was opened just before 6:10am and all of us took a brisk walk/slow jog to the starting line. The race started on time at 6:15(flagged off by Deepika and a few other 'celebrities'. Having managed to get myself close to the front of the start line I crossed the start line in 12 seconds. Vasu and I started together and got off to a good start covering the 1st Km in about 5:22. At this point Ravi Balasubramanya joined us - though a much faster runner he decide to run the race with us(probably due to inadequate training). As always in the first few Kms it looked like there were lots of runners ahead of us. In reality we were probably in the first one third of the pack of runners. Around the 5Km mark Priyankar - another very strong runner - joined us and the four of us then pretty much ran together for the next 25Kms. The weather was definitely much much cooler than it has ever been in a race in Mumbai and the 6:15am start was indeed a great help. The point of merger with the Half marathon runners was a bit of a bummer as the slower runners came in the way of FM runners impacting their momentum. The four of us managed to weave our way through the crowd reasonably well all the time hollering out for the slow runners to give way and keep our 5:27 per Km average pace. We had crossed Sid Mallya from Bangalore during this stretch. In the stretch leading up to the sea link Milind Soman and his friends went past us. The Mumbai crowd as was to be expected had special cheers for Milind. 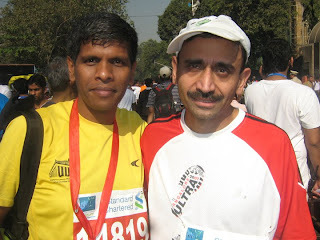 (Milind's finish time of 3:49:53 is very impressive and a huge improvement on his time of last 2 years). In the stretch leading up to the sea link a wide patch of shade had been created by putting up a tall side shamiana for a fairly long stretch. This was a pleasant and welcome improvement. At the sea link we were still running at an average pace of 5:27 per Km. One big change from last year was the presence of two water points on the sea link which was huge boon to the runners. Around the middle of the sea link stretch Vasu slowed down while I continued running pretty much with Ravi and Priyankar. I got to the 29.9Km timing point at 2:43:31(5:29 per Km pace) as compared to 2:45:21 at the 29.7Km mark last year. And felt much much stronger compared to last year. Somewhere at the back of my mind I was hoping that my timing chip was registering at all the mats - at the 29.9Km mark this got confirmed. Of course, as with any FM the last 12Km is the toughest and more so at Mumbai where you hit the Peddar road flyover in this stretch. Also it got warmer though it was not really hot. At the Peddar Road flyover Priyankar took off- I could not quite keep pace. I just focused on keeping the current pace below 6 minutes per Km. At this point it was clear that I would go below 3:59 fairly comfortably. Going below my previous best of 3:56:49 seemed very possible. Now I hung in there from Km marker to the next one. As I turned from Marine drive towards Churchgate station for the last 2Kms I ran at a fairly comfortable pace to get to the finish point with a net chip time of 3:52:48!! I felt much less tired at the end - so much so that I felt maybe I should have pushed harder in the last 5Kms to shave off a few more minutes. However, I am very satisfied specially to have exorcised the ghost of Hartford and achieving the 2nd sub 4 of my career in 26 Full marathons!! Chandra with a time of 3:47:42 was at the finish line. Soon after I met Rajesh Vetcha of Hyderabad runners and also my brother Mahesh and his daughter Divya. Mahesh and Divya had come all the way from New Mumbai to experience the marathon atmosphere and try and take a picture of me finishing. However, he had not expected me to finish in below 3:55(well nor had I expected to do it this year) - so he missed me by a few minutes at the finish line. Below are a couple of pictures taken a few minutes after completing the race. - there was a 5hr FM pacer and 2hr and 3hr HM pacers; pacers for every few minutes of finish time are common in most international marathons. Overall it was a great run for me and for a number of friends. It maybe a tough act to beat this next year unless the weather gods are kind again.